Twitter used to be an internet sideshow. In its early iterations it was a stream of consciousness in 140 character bursts from a small number of people (largely from the tech community). The earliest version of Twitter had no way to automatically retweet, or to do a quote tweet, or to do a tweetstorm. Then, something happened: it slowly became the accepted way to spread breaking news or for public figures to directly communicate with their followers. It became such a crucial part of the American media landscape, so much so that the Library of Congress archived every single tweet from 2010 until the end of 2017. Twitter has become a legitimate running record of what is going on in the world at any given moment. It’s the perfect medium for research. I managed to scrape 1.5 million tweets from current Members of Congress, starting with CSPAN’s list of members of the House and the Senate who are on Twitter. A few caveats here. Twitter only allows a researcher to grab the last 3,200 tweets for any one user, so if someone tweets prolifically I don’t have their entire timeline. Also if a member of Congress had a different Twitter handle before they won election then switched it, they might have started a new account. I don’t have their prior account. With those in mind I wanted to tackle a singular question: What has the usage of “thoughts and prayers” looked like over time? The term “thoughts and prayers” evolved into a political meme when member of Congress began to use the term in the wake of school shootings across the United States. The Twitterverse picked up on it’s usage (largely by Republicans) and used it to point out that tweeting “thoughts and prayers” is no replacement for actually passing gun control legislation. But is that a fair characterization of its usage on Twitter? In reality, the term “thoughts and prayers” has been used for a wide variety of tragedies at home and abroad. It is true that many of these tragedies revolve around mass shootings. For instance, the graph above contains spikes for at least ten instances of multiple gun fatalities on American soil. However, that’s not the entire story. “Thoughts and prayers” has also been used for events like the crash of Malaysia Flight 370 or a series of deadly tornadoes that swept through Oklahoma in 2013. Additionally, it was used as a way to acknowledge terror acts in Paris and Nice, France. It was, at least at one point, the go-to phrase for a member of Congress to tweet when something tragic happened. From a total volume standpoint, the Stone Douglas school shooting received as many total tweets as the Boston Marathon Bombing in 2013. 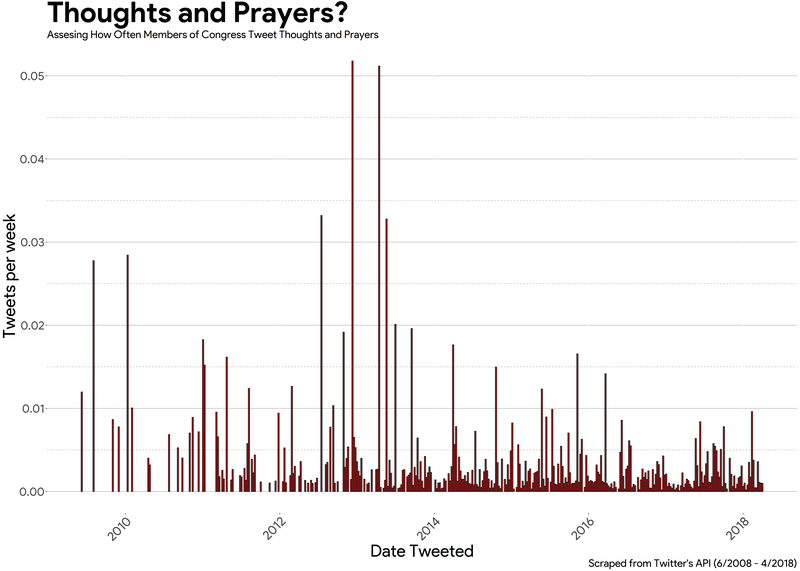 The shooting at a Congressional baseball practice in 2017 and the attack on the Las Vegas Strip also received a lot of “thoughts and prayers.” There has been an obvious increase in total Twitter volume in recent years. From a percentage standpoint, the Boston bombing received the highest percentage of total Congressional tweets, but even then only .05% of all tweets from members of Congress that week included the phrase. The graph above makes two changes: first, it moves from weekly bars to monthly bars to aid in visualization but it also divides the tweets by party. There is a noticeable trend here. It’s clear from mid-2013 until early 2017 that the phrase “thoughts and prayers” was frequently used by Republican members of Congress. In almost every month they used it more than their Democratic counterparts. However, that changed in 2017 and Democrats began using the phrase more and more, especially relative to Republicans. For instance in 2016, Republicans used the phrase 390 times vs. 206 by Democrats. In 2017, Democrats used “thoughts and prayers” 550 times vs. 525 for Republicans. For the first four months of the 2018, Democrats have used the term 65% more than Republicans. This is obviously a trend to watch going forward. How can we understand this finding? There are a number of possible explanations. The Republicans were sensitive to the memes that were mocking the usage of the term and decided to use the phrase with less frequency. More Democrats began to use the term in a mocking way on Twitter. Text analysis is terrific but it does not yet have the ability to pick up on context such as satire or condescension. Democrats felt that they had gained “issue ownership” on gun control and could try to control the narrative. Either way, I think it’s fair to say that this is an instance when internet culture clearly is having an impact on the way that politicians communicate about issues on social media. This is only the tip of the iceberg in analysis social media usage. If a social scientist wanted to create the graph above using public remarks of members of Congress to look for the mention of certain terms or ideas, that would have taken tens of thousands of hours just a few years ago. Today it takes just a few minutes. Next Who supports women’s ordination in America? It’s not who you might think.